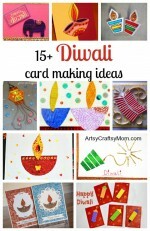 Send out your Diwali greetings to extended family with a fun firecracker themed Diwali Greeting Card! 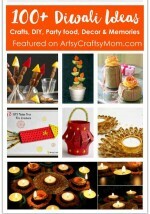 Easy to make with basic craft supplies. 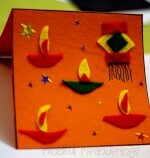 These Diwali Foam cards went out to all the relatives this year. Simple red cardstock & pattern foam. Each year we try and make a special card for the extended family. My parents, Hubby’s parents, my granny, My brother in law and family & my sister. It’s so much fun to make something and send. As a kid, I loved making cards & posting it to all relatives & friends. This year too was no exception. Miss P loves firecrackers but is very scared to burst them. She had burnt her fingers during 2011 and still gets scared. So an easier alternative was to make the non-scary ones at home. Miss P loved the idea. The cards are super easy to make. Patterned Foam in various colors – Red, yellow, purple green, orange – Again from Itsy Bitsy. Golden pipe cleaners. These are available at Itsy Bitsy as a pack of metallic pipe cleaners. 1. Fold the cardstock in half to make a card 6×8 inch. 2. Cut the foam pieces into a cracker shape – one rectangle 2×4 & 1 triangle 2.5 . 4. Stick them all together as shown in the picture above. I used Glue gun to quickly stick them. You can use fevicol too. 5. Stick them onto a Blank Card. Decorate with glitter tubes & stickers. Add your Greeting. We spend a quiet Diwali away from home. How was your Diwali?? « Planning for your child’s future – Your #BabyGotPlans, Do you? They look so good…Do you get pipe cleaners in India too? Lovel lovely lovely… Shruti. Happy Diwali to you.